The great days of the department store are probably over. There are survivors including two of the best known, Harrods in Kensington and Peter Jones in Chelsea. But the time when every city and every large London suburb had its own individual department store is gone. The old names are not forgotten. In Kensington High Street the two great buildings which were home to the two department stores Barker’s and Derry and Tom’s are still there. The Barker’s building has a number of retail businesses and is also home to Associated Newspapers. The Derry and Toms building contains three separate stores and of course the Roof Garden is still a going concern. The Roof Garden deserves a post of its own and we’ll come back to it at a later point. But I remember a third store on Kensington High Street as I’m sure many others will. I was dragged through all three of them by my parents at some point in the late 1960s. I remember the roof garden of course, a pushy salesman trying to foist a nasty pullover on me (my mother resisted all his efforts) and a fascinating vacuum tube payment system which sucked your money away at an alarming speed and returned your change just as quickly. That happened I think in the third of the great stores of Kensington High Street – Ponting’s. Here are two photos from 1971 of the arcade which leads to Kensington High Street tube showing on one side an entrance to Derry and Tom’s (now the side entrance to Marks and Spencer) and on the other the display windows of Ponting’s. As you can see, the Grand Removal Sale has already begun. So what did Ponting’s look like? This photo is from the 1950s. The “House for Value” was located on the corner of Wright’s Lane. Twenty or so years later the sign is still in place but the closing down sale is on. Note the sign for the roof garden in the top left of the picture. Inside Ponting’s everything was for sale. Some departments were busier than others. And finally an image of Pontings from an even earlier time, an interior from 1913 when retail therapy as we know it was still in its infancy. Next week I’ll be doing another vanished shop, but quite a different one from Ponting’s. This entry was posted on Thursday, October 13th, 2011 at 10:42 am	and tagged with Barker's, Derry and Tom's, Kensington High Street, Ponting's, Roof Garden and posted in 20th Century, Forgotten buildings, Kensington, Shopping. You can follow any responses to this entry through the RSS 2.0 feed. Whew, I remember the tubular change dispensers but at Marks and Spencer, must have been in the early 70s? I think Biba was on the Derry & Toms site during the 70s. Talking of department stores I remember the Marks & Spencer branch in Portobello Road(didn’t they start there on a stall) as well as Boots etc. Most people who complain about the chain stores in Portobello don’t seem to be aware of that and very handy they were too! My aunt worked in the perfume department of Derry and Toms in the years just after the second world war. She was in all senses such a beautiful woman. I worked in Derry and Toms as a Saturday girl in the mid-seventies and they had a vacuum system instead of tills. You used to have to hand-write a receipt and put it with the money into the container, twist it shut and then pop it into the tube. Eventually it would come back again with the change in it and a stamped receipt. must have been early seventies actually. I also worked at Derry and Toms as a Saturday girl, in the 60s though. I worked in the stationery department where they took exception to my bare legs, me being a fashionable teenager, and not being a nylons kinda girl. My best friend, who also worked there, and I would go to the Kardomah Coffee House, or was it Kenco, to have coffee afterwards, in Kensington High Street, just east of Kensington Church Street. Ms. Reich-Silber, I am trying to locate a former employee that I knew in my student days in London. She did work for Derry & Toms as the model in model gowns from the latter part of 1961 thru mid 1962. Her name was Ms. Ann Murphy. I would be obliged if anyone remembers her or has contact with her. I now live in California and I am 81 years old – retired from law enforcement. Thank you very much for forwarding this information. It’s amazing what and who turns up isn’t it. Hi Carol, my father worked as a shoe buyer in Burgess’s soon after the war ended. His uncle owned the store I believe. His name was George Davies. Hi Nicole’s, My (half) brother and sister are Davies and their uncle was also George Davies. George was one of six brothers the youngest, who was killed in the war in the Merchant Navy, was their father. Which brother was your grandfather? I imagine you have probably met my brother and sister at one of the family reunions. just some extra info about derry & toms in my days there, on any given evening when there was a function up in the roof garden etc, we used to use those fold open hospital type screens on castors to ” screen off ” the shop during those functions as some guests did try to wander around the shop when closed, we had our meals free those evenings & the company paid for taxi.s to take us home if it was after midnight. I worked in the bar in the late sixties when there were banquets….those screens would be pulled back after the meal and speeches and a sea of people would rush to the bar !! Had to remember the price of drinks and add it all up in our heads…and give change from old-fashioned tills that didnt work it out for you !! My dad Liam ( or Bill) Harty who was an underbuyer and planner in kitchen furniture used to man the cloakroom with his friend Jimmy Barnes . 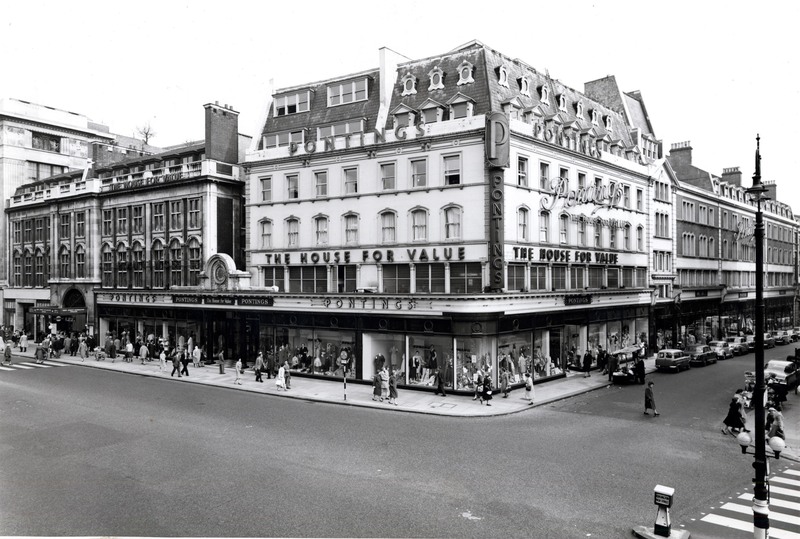 Brighton and Hove had several very department stores – Hannington’s being the most well known, but there was also Hills of Hove (later taken over by Debenhams and then closed down), Wades, Chiesmanns, and the Co-op which was remarkable due to its sheer size. Great memories…I worked at Derry&Toms in 1970. A kid from rural Canada ….quite an introduction to the British class system. Most of us were young…students or just travelling. Thoroughly enjoyed the London of 1970! I worked in Derry and Toms as a Saturday girl from 1966 to 1970….in different departments but mostly in the Shoe Dept. My father, mother and sister also worked there and my two younger brothers worked in Barkers………..another world……remember the staff canteen had birds that would fly in the windows and land on the tables ! Reference Burgess’s Department Store in Tottenham, I still have some of the coins that were used there. I used to work their as a Saturday girl and it was a lovely friendly store. Does anyone remember an Irish lady by the name of Ita Lynch who worked in the shoe department at Derry & Toms in the 1960s? She was my mother and I am trying to trace anyone who knew her back then. Thanks for any help you can give. She also worked at Gorringes Department Store, either before her stint at D&T or after. Cameron. I live in San Francisco now but lived in Brighton for years. I too remember Hanningtons (took up most of the length of North Street if memory serves) and Vokins and Hills of Hove. All great shops and I was sad to see them go, especially Hanningtons. Angela. Perhaps you knew my mother Ita Lynch as you worked in the shoe department as well. Please let me know if you did. Trying to trace anyone who knew her back then. Thanks. I had a boss called Miss Lynch who was the buyer of the shoe department. She was strict but fair as I remember. She didn’t like me standing around gossiping so always found me something to do which was usually dusting! Angela. That sounds like my mother! She was strict. Was she Irish to your recollection? Do you know anyone else that knew her who is still alive? She was Irish yes! Am afraid I did not keep in touch with anybody else that I worked with all those years ago. I remember always being told to serve in the children’s section as your mother said I had a way with them! I think it really was because the other assistants wanted the better commission to be earned on adult shoes! There was an older lady working there too that had been there all her life since she was 16 years old…. amazing. Just remembered her name….. Miss Francis….. She must be long gone. Is your mother still alive? Angela, no my mother passed away almost nine years ago. Thanks for sharing your memories of her though. I wanted to find friends of hers to see if they remember who she was going out with at the time. I believe she was dating a foreign chap (from either India, Malaysia or Sri Lanka) and I am trying to find him now. If anyone else reading this knows who this man could be, please will you contact me. Thanks. Forgot to mention that my mother’s name was Bridget Lynch but she was also known as Ita. some more recollections of my time spent in derry & toms, a relative of mine, mr sid hopkins – security /fire officer at the time with the company & based in barkers next door, got me started in the menswear dept, in derry & toms, from 1970 until it closed down in 73, i transferred to barkers next door but did not like the regime there, did not have the same family feel at derry & toms had, so i looked else where for a job, moved to john lewis in oxford street & 42 years later – still there. Hi Tom. Amazing that you are still in the same job 42 years later. Congratulations. Longevity in a job is rare nowadays. There are two trains of thought on this. Speaks well of the company and the employee but some also view it as the employee is too scared to try new things. I was with my last job (in SF) for almost 18 years and have been unemployed now for just over one year. Some prospective employees have been impressed by my tenure at the last job, some have not. I see it as a positive but in this day and age, especially in the technology industry, it seems to be a negative. Still looking…..but good for you. not wanting to de tracked so to speak regarding derrys, had it remained open i might well have stayed there, as it turned out, i got a job in the menswear dept of john lewis in oxford st, looking back i was paid £18 per week plus a penny in the pound comission, that in 1972, in j/lewis they started me off on £24 per week, a six pound increase was amazing, no commision at j/lewis but on reflection the annual staff bonus averaging 15% more than made up for the lack of comission plus the fact the the competion for getting comission was by its very nature – cut throat, j/lewis as a company have just celebrated 150 year anniversary, over the years the company has looked after me & my family big time to which i am grateful, so this organisation is in my humble opinion, is the best one could have in retailing as retailing is to day, it does’nt aim to be all things to all people but if in the round it suits the indivisual then its done its job. Dave. I believe Harvey Nichols is another department store that has stood the test of time. Is it still around? I remember visiting a cousin of mine in London many time and HN was her favorite shop. We were always in there but she too now lives in SF. There is only one shop in SF that has been around for many years and that is Gumps. It is in the same street but some years back moved its location – across the road. I believe it has been around for about 150 years but was destroyed in the 1906 earthquake. It was rebuilt and it is a lovely shop with all sorts of things to buy; furniture, art, etc. The other shop that was around for many years was the Emporium but that sadly has now gone. Yes Harvey Nichols is still a going concern with several stores across the British Isles ( http://www.harveynichols.com ) and a place of cultural as well as retail significance in London. And they’re still in the same building which I featured in this blog post:https://rbkclocalstudies.wordpress.com/2012/05/24/empty-streets-sloane-street-and-lowndes-terrace-1902/ contrasting them with their neighbours Woolland’s. Thank you for forwarding this, I’ll put in my file. If anyone knows where the former department store of Walpole’s was, I’ll be most grateful to know. Back in the 60’s Pontings was a great place to buy material, I was into making my own clothes. It was an absolute treasure trove of fabrics, and your purchase was parcelled up with brown paper and string, wonderful! My grandmother Violet Pridmore worked in Pomtings for many years during the 1960s as a cashier on the ground floor. One day, Bing Crosby walked in and asked her where Maureen Buckley worked. She worked in Accounts and her daughter was an au pair for Bing Crosby’s children. I remember the lift in Pontings which was operated by a uniformed man pulling on a rope. I think the tv show Are You Being Served was based on Pontings.